Everyone loves knit or crochet socks, and we have a pair of each for you. 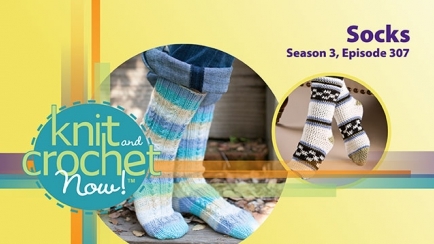 Robyn shows how to make crochet a pair of graphic socks designed by Jewdy Lambert. 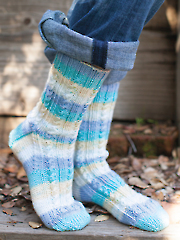 Next up, Kristin takes you step-by-step through making a pair of striped socks by Lisa Carnahan. Afghan Square is Crochet Cross Over. Disappointed that she didn't show how to pick up the stitches on the heel. Needed more time to show some of the details for people who are trying to learn to knit socks which is the point of watching these videos. Disappointed that the pattern and the video do not explain how to increase or decrease the size of the knitted sock.